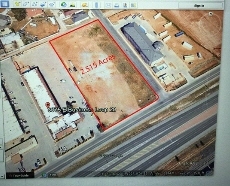 2.515 Acre lot sits between two hotels in booming Odessa Texas. With hotel rooms ranging from $300-700/night, this is an excellent investment opportunity. Perfect location for hotel, retail, restaurant, church, office, multifamily, use your imagination. Priced to sell and located on Business 20 (Hwy 80) and French Avenue on a corner lot in the middle of a nice hotel and restaurant district in Odessa Texas. 2.5 Ac vacant lot located on Business 20 (Hwy 80) and French Avenue on a corner lot. Zoned Light Commercial and located in a hotel, restaurant district . Perfect location for a hotel, restaurant, office building, multi family, church, use your imagination. This level lot is on the corner and has hotels on either side. Perfect location on Business 20 and French.